It’s 1987. It’s a cold, wet and miserable day at Argana Park, the home of the Elizabeth Football Club, the playground for much of my childhood. Like most weeks during the winter in recent years, I’m standing on the scoreboard. This week, I’m all by myself. My clothes are drenched to the core and my parka is providing no cover from the rain. The oval is a swamp, it’s been raining for what seems like months and the water is lapping up against the concrete base of the coaches’ boxes that are about 150 metres to my right. The Elizabeth Football Club became my home away from home when I was about six years old. My dad, who later became the A Grade team manager, barman, committee member and junior coach, decided to pull off the Main North Road, which feeds traffic from the city to its northern outskirts and beyond, and said, “Let’s have a look at some footy”. Two years later, the footy club is my Saturday and Sunday home, seniors one day, juniors the next. I’m also there several other nights a week, generally playing the ratbag and getting under the feet of the senior players or Ray Bonney, the bingo caller who continuously gets frustrated by us kicking footballs near the hall and interrupting his call. Clickety click. At some time or other, kids involved in the footy club find themselves working the scoreboard, just as I did for about four years. Each home game would have me carting the heavy, wooden numbers across the oval to the scoreboard, generally by myself, unless someone offered to drive them around. Then I’d sit there, intently following the game, keeping an eye on the play and ensuring I didn’t miss any flag waving from the goal umpires. The scoreboard would become a magnet for any of my mates who happened to be around the place, blokes like Mouse Prosser and Lee Nicholas and other assorted club rats. That’s when disaster would often strike. I’d like to think that I didn’t miss any scores, or put doubt in the mind of the players about the result in a close contest. But, that’s probably not the case. I took the job seriously enough that I’d be disappointed when the central umpire would call me over at a break to tell me there was a behind or a goal missing. I must have been kicking the footy when that goal was scored. There were times when departing the post was necessary, the bladder can only hold so much Fanta, and a friend would be entrusted with adding any fresh scores to the board – but how well can you trust a mate to care enough to get it right? Eventually, age ensured that mugging with my mates was more important than standing on the scoreboard, sometimes with no-one for company, and I abandoned my post to some other sucker. By the age of 18, my childhood dreams of playing A grade for the Eagles were realised. And with my first kick of the footy at that level, one of my successors added a major to the scoreboard. Coming on to the ground mid-way through that game against Modbury in the SAAFL, I waltzed across the half forward line and marked the ball about 35 metres out, with my coach, ex-Central District player Rob Fraser, bearing down on me. Knowing what the coach would be thinking, I nervously dabbed my shot at goal and it was, thankfully, accurate. 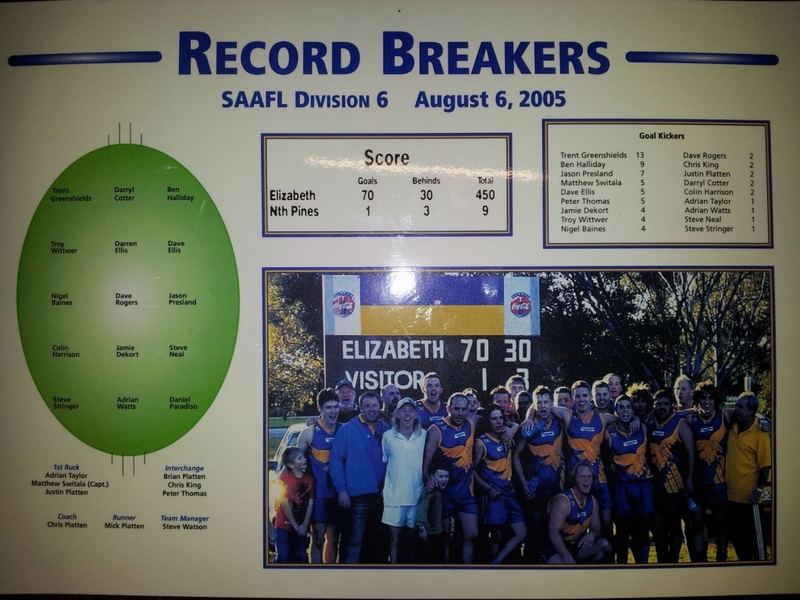 We had a win that day, but it was nothing like the one the club celebrated in 2005 when the A Grade booted an amateur league record of 70.30 (450) against North Pines, beating the previous titleholder by 58 points. A very busy day for the scoreboard attendants at Argana Park. While I had moved away and did not play in that game, the result topped the club’s previous top score of 60.29 (389) against Ovingham (at their ground), a game in which I had played. Elizabeth went on to win the premiership in both grades that year, the A grade coached by Chris ‘Scully’ Platten (brother of legendary Hawthorn rover John) and the reserves by Michael Richard. My last kick in football for Elizabeth was also a goal added to the scoreboard. C grade, last 2012. A side-foot soccer goal from 25 out. Popped my back just before kicking that goal, it ended up being a bulging disc – farewell, football. In 2013 the club held its first past players reunion this season and while the day was successful, the club could not pull off a win against its current nearest rivals, Trinity College Old Scholars. A look at the scoreboard today reveals that it hasn’t changed much since I was a young lad, although a lack of hooks in some parts means the numbers are secured by gaffer tape. There is also a metal grate to stand on, rather than the wooden boards I endured as a lad. The signs of various sponsors have graced the boards over the years, from pest control companies, to brewers and car yards. The current name on the board is that of, Adam & Son Fabrication, a sponsor, without whose support the club would struggle to operate. Another thing that is certain to have not changed is that the fair weather friends of the scoreboard attendant will find other things to do when the weather’s wet. It can be a lonely job, especially when you’re only payment is a can of Coke and a pie with sauce. 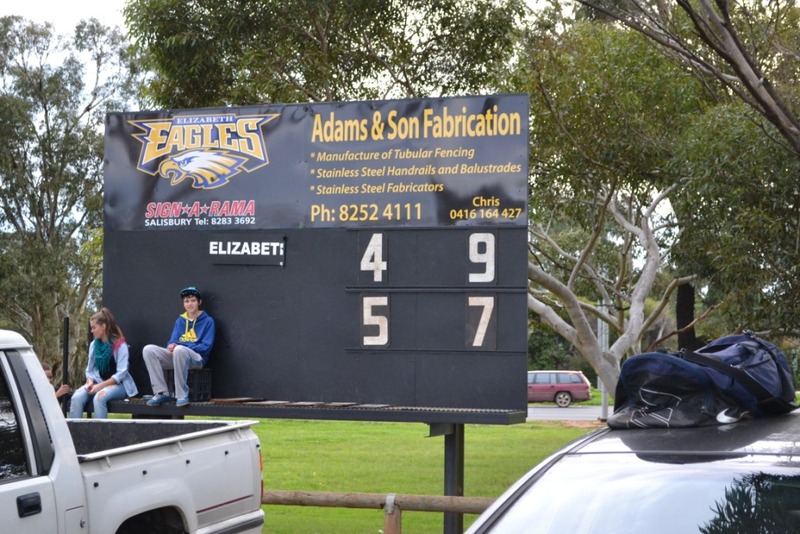 Rob McLean’s previous contributions to Scoreboard Pressure have been about Berri Memorial Oval, Borrika Oval, Moorook-Kingston, and Sevenhill Cricket Club. Rob is editor of the South Australian-based cricket website Wicket To Wicket.